It’s taken me a while to get back to this, but in response to my post from a few weeks ago, many of you have made and posted some wonderful photo mosaics to the Flickr group. You had quite a productive 2013! It’s been fun to look at your mosaics. Theresa went through and collected them all into two galleries (there were so many photos, they didn’t fit into one gallery! ), so if you’d like to view the mosaics all together, click here and here. And be ready to be inspired by all the wonderful sewing! I picked three mosaic-makers at random and asked them to reflect a little on their sewing 2013 as well as to think ahead to 2014. I asked about accomplishments in 2013, new skills learned, and what they were most proud of. I also asked them to talk about their goals for 2104. Here’s what they had to say. One of my (sewing) highlights of the year was thanks to my Mom. She put the word out to her friends that I’m always looking for buttons. Several of them responded by sending me some fantastic collections. My daughters helped me sort them by color, and now finishing a project is so much fun because we can go to the jars to find just the right buttons! In 2013 I learned that my sewing machine has a triple stretch stitch perfect for knits. I had taken my machine in for maintenance, and when I got it home I looked at the stitch test the repairman had left behind. I was surprised by the variety of stitches it included so I got out my manual. It was definitely an “aha!” moment, since my girls’ favorite patterns are the Field Trip Raglan T, the Hopscotch Top, and the Playtime Dress and Leggings. Now I can sew up all those knits without fear that they will come apart at the seams! I have high hopes for 2014, as I think I’m getting closer to pinning down what my daughters will wear and what they will not. And I’m starting to be okay with the fact that sometimes I will be sewing things solely for my own pleasure. Looking back at 2013, I can see now that I wanted to stretch myself by learning new sewing techniques. I would love to sew everything, but I choose my sewing projects carefully, often looking through the Oliver + S Flickr pool for inspiration. This Music Class Blouse, sewn by Shelley (aka Lightning McStitch) was the push I needed to sew my very first Oliver + S pattern. I learned how to sew a sleeve placket! I loved the clear instructions (with excellent illustrations) that taught me how to navigate a tricky technique. I’m happy that I was able to make my daughter a handmade gift for her first week of kindergarten—she wears her Music Class Blouse all the time! There were many memories made this past year. For me, handmade garments serve as a visual reminder for those memories, and also, to remind me that my kids will only be little once. Looking forward to 2014, I plan to sew a proper pair of trousers for my son, with the Art Museum Trousers Pattern! I have never sewn a pair of trousers before (the pattern pieces for pants causes me a lot of confusion), but I know that Oliver + S will provide the best pattern for fit, style, clarity of instruction and a positive learning experience! 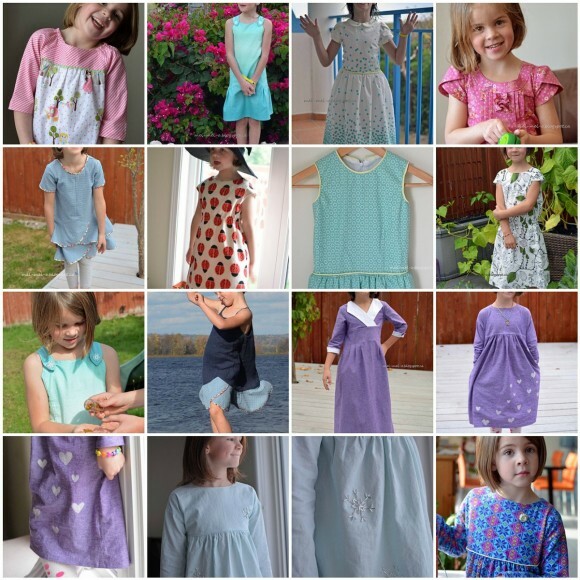 Irene blogged more about her 2013 and 2014 sewing endeavors and plans as well. 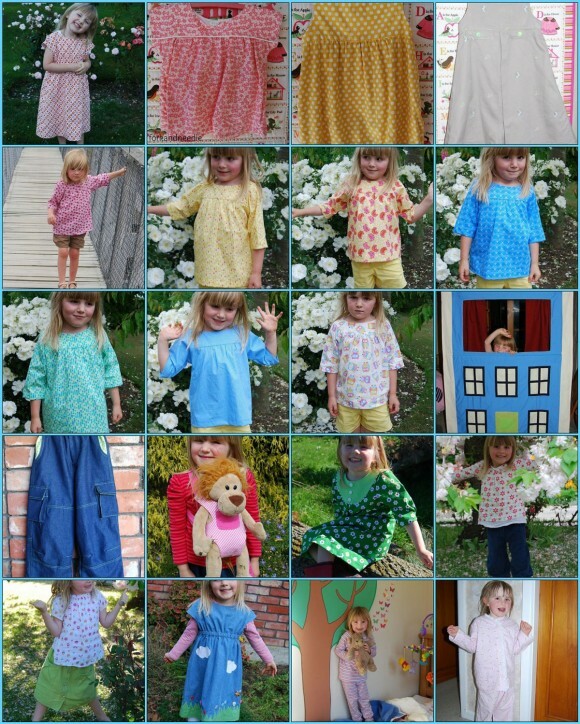 My sewing for 2013 has been mainly for my daughter and as gifts. I’ve completed some outfits for myself, and although I have been sewing for years I am becoming more confident about fitting. I continue to learn heaps from Liesl and Co. patterns and now buy them to learn new skills as much as for the pattern. (Recently I made some Colette trousers and used the instructions on putting in an invisible zip from the Fairy Tale Dress.) I have adapted patterns more and my daughter is also giving me ideas on what she wants me to make. I know that to continue to have her wear my sewing (she’s four now), I need to share with her more of the decision process. My favorite garment of 2013 would have to be the Roller Skate Dress I made with flowers and bugs on it. In 2014 I want to make more of my daughter’s and my own clothes and may even try some for my farmer husband. Like most people, I want to make a dent in my stash as well as make more bags, quilts, gifts, etc, and knit even more. Getting better at fitting garments will continue to be a goal. Also, I need to make use of the many sewing/quilting/knitting books I own and use some of them as much as I use Little Things to Sew. We live on a farm and life is fairly quiet so we don’t dress in “up to the minute” clothes. We wear comfortable clothes that suit the weather and the work we are doing. But it is nice to get a bit fancier for special occasions. When I hang my clothes on the washing line I always hang items alternating between home-made and bought. Usually “bought” wins, but occasionally it is a close race. I want to hang out more home-made things, and that may mean I need to knit more socks, sew more singlets and undies … but I’ll get there. You can read more of Taryn’s sewing and crafting goals for 2014 in her blog post. Thanks, everyone! I can’t wait to see what you accomplish in 2014! 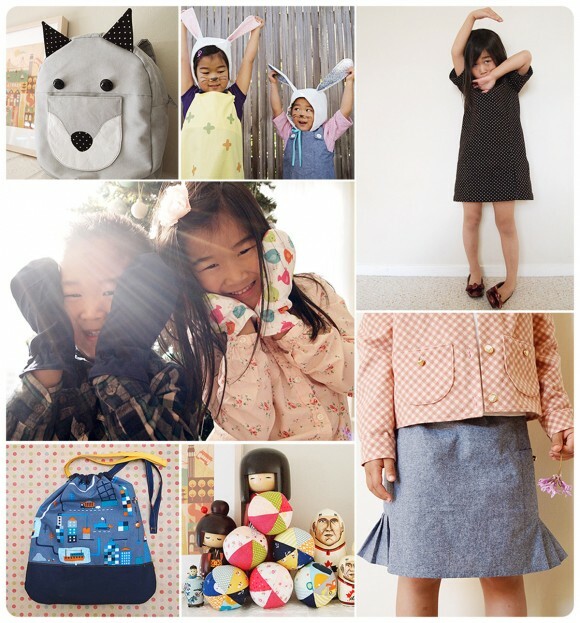 i just discovered Froo and Boo this week via Flickr- her kids are soooo adorable and love the clothes too! Oh, I think so too! It’s really amazing to see how many of you are sewing beautiful things for your adorable kids. So fun to see! Thanks for this lovely post Liesl. It’s so nice to read that others neglect their household chores too! Irene, if I truly inspired you to start sewing Oliver + S patterns then I’m delighted and so flattered! Yup, Shelley, the blouse you made for your daughter is so awesome! It really made me see the possibility of using different types of fabric and prints with each pattern. Besides, your daughter is adorable!